Partnering with Two Gander Farm (Lancaster County), the West Philly market harvested honey from urban beehives throughout Philadelphia. The “Summer in the City Honey” program produced sweet stuff bottled from neighborhoods around town and also offered an unusual opportunity for locals to become urban apiarists. “We would sit by the hives every day and watch the bees fly in and out,” says Neidermeier. In May, the hive, which housed thousands of honeybees, was relocated from Lancaster County to the family’s yard. The bees worked tirelessly to produce honey until July, when it was harvested and they were taken back to their country home. When the project was first conceived, no one anticipated they would bottle thousands of honey jars. But finding homes for the hives was easy—Milk & Honey received at least 35 requests. “We looked for backyards that were fenced and relatively isolated,” explains Milk & Honey co-owner Annie Baum-Stein. Hives were distributed in West, South and North Philly, as well as, appropriately enough, Queen Village. A portion of the proceeds benefit the Philadelphia Orchard Project. She says the Philly bees are exceptionally healthy thanks to their stay. 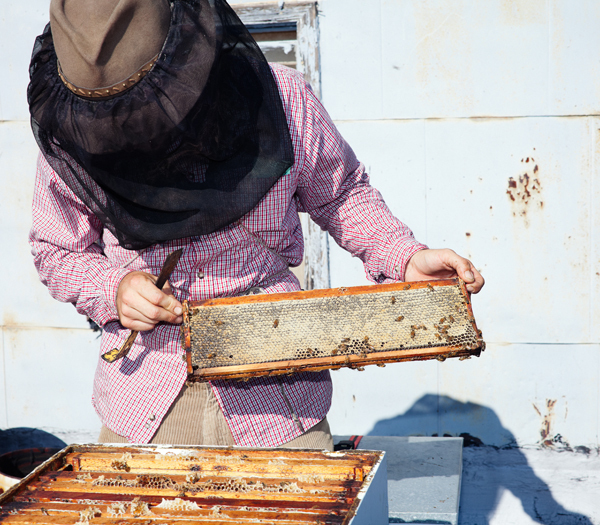 “The bees are now fortified and have been spared a lot of pesticide exposure,” says Baum-Stein, who hosted a lively hive on the roof of the market with the help of Trey Flemming, Two Gander Farm’s resident apiarist. “Amazingly, honey harvested from our roof and honey from four blocks away tastes very different, ” she adds. With the exception of two hive tragedies—a tree crushed a hive during a windstorm and a queen died in Powelton Village—the project is a testament to sustainable living, something Baum-Stein says inspired her to open Milk & Honey in the first place.